One of SUU's youngest and most celebrated traditions. 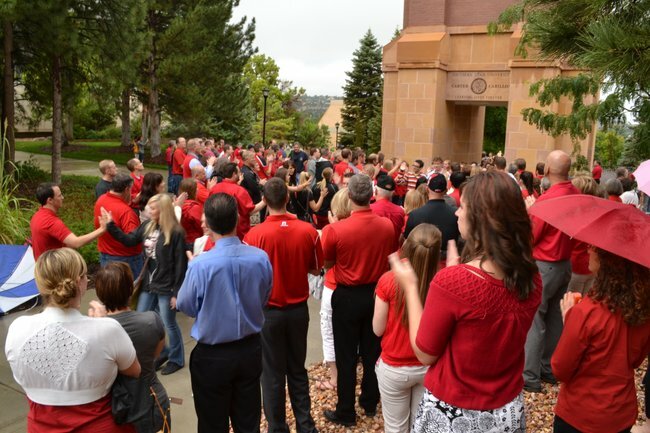 Each year during Freshmen Orientation, incoming students walk together from the Centrum Arena to the Carter Carillon bell tower where they are greeted by cheering SUU faculty, staff, alumni, and other students. The new students then walk beneath the tower, heading east signifying the beginning of their journey at SUU. They are then asked not to walk beneath the tower again until graduation day. Leading up to the Homecoming football game , there is a week full of wonderful events for students as well as the community. Students are able to attend the game for free with a valid student ID card and the community can join by buying tickets at the SUU Centrum Ticket Office or by calling 435-586-7872. 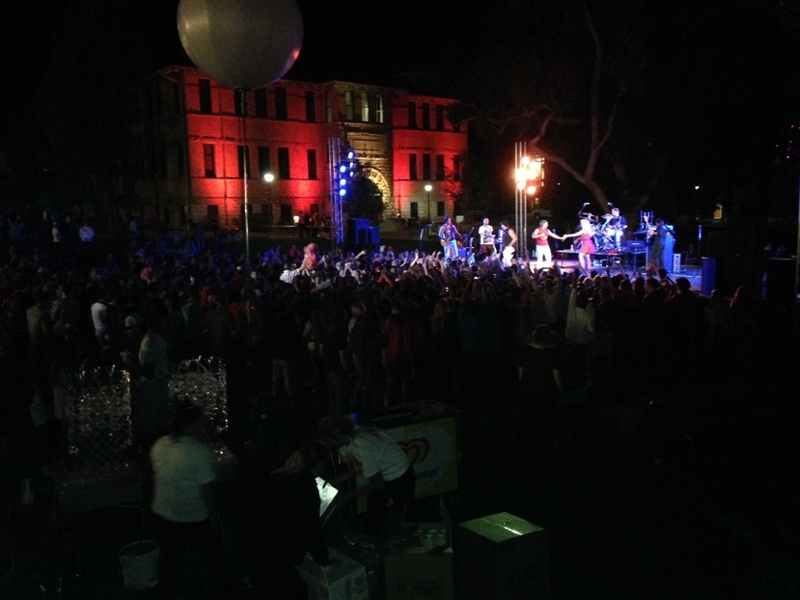 The events preceding the game usually include a Miss SUU Pageant, Powderpuff football, a pep rally, an alumni reception, Alumni Awards Banquet, and a celebration known as Forever Red in the Upper Quad that includes live music, food, and fireworks. On Homecoming day, there is the annual Homecoming parade which runs along University Boulevard. Held the Friday night before the Homecoming game, this free celebration includes live music, food, and a thrilling fireworks display. This event offers the perfect opportunity for alumni, students, and community members to gather together and celebrate. All these festivities are free of charge and held in the Upper Quad near the Adams Theatre and 300 West. Every Friday we wear red to show our true T-Bird pride. Also, earn merit money for your club by wearing your favorite red SUU shirt. 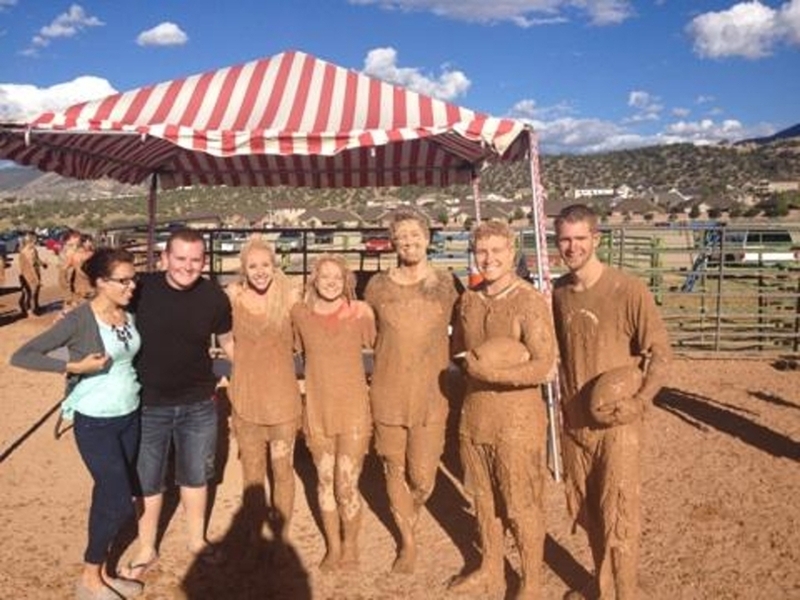 Mud Football, a twist on the typical American sport that leaves players smeared with mud from head to toe. This favorite Southern Utah University tradition began years ago and it’s back with a vengeance! Welcoming all students, faculty, staff and alumni to throw the pigskin and get extremely dirty, the SUU Student Association (SUUSA) will offer this event for free, usually at the start of Homecoming Week. Worried about getting mud on your clothes? Just come and watch your peers get slimed and enjoy a slice of free pizza. As our team comes blazing through! As we sing our victory song. And the T-Birds win once more! Go, Go, Go… Fight, Fight, Fight…. Win T-Birds! Note: The SUU Fight Song is the copyrighted property of Southern Utah University. Any use of this song for commercial gain is strictly prohibited.